Serious observers understand that working with Russia to ease Syria’s civil war is the only way to stop the crisis. 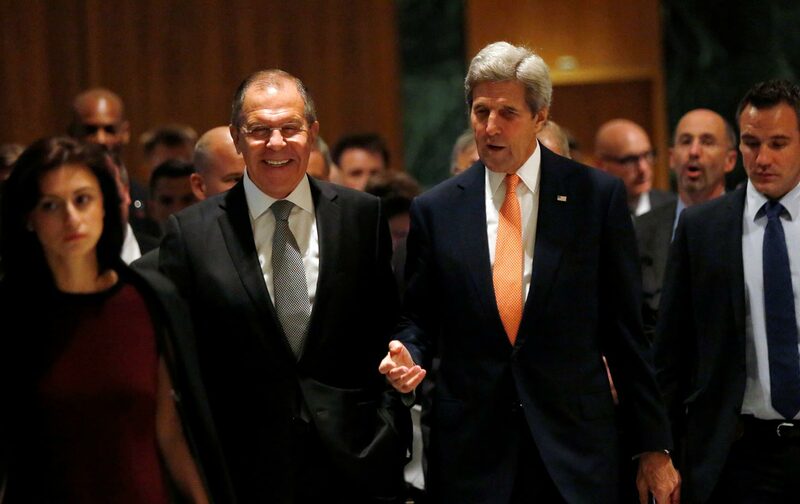 In Geneva on Friday, Secretary of State John Kerry and his Russian counterpart, Foreign Minister Sergei Lavrov, announced a plan to impose a cease-fire in Syria beginning Monday evening, September 12. Provided the cessation of hostilities holds for seven days—which is no sure thing—the United States and Russia will take, in the words of Lavrov, “coordinated steps” to target both ISIS and the extremist al-Nusra Front, recently rebranded as Jabhat Fatah al-Sham. The agreement, which the Syrian government supports, also calls for the grounding of the Syrian air force over non-ISIS held territory and for the creation of a humanitarian corridor to supply the besieged city of Aleppo. Meanwhile, the chairman of the House Committee on Homeland Security, Texas Congressman Michael McCaul, appeared on MSNBC Monday morning, telling Joe Scarborough, “I don’t really trust the Russians.” One prominent neoconservative pundit sneered, “If Donald Trump wins the presidential election in November, he might want to make Secretary of State John Kerry his special envoy for U.S.-Russian cooperation in the war on terror.” Whether or not hardliners like McCaul trust the Russians, securing a cease-fire would go a long way toward addressing the rapidly unraveling humanitarian crisis on the ground, while increased US-Russian cooperation might lead to the defeat of ISIS and al-Nusra in Syria. Many of the objections to the agreement center around the fact that Assad’s forces are backed by both Hezbollah and by the Russian air force. Yet why this should concern American policy makers is something of a puzzle: After all, Hezbollah poses no threat to US national security, and it is neither pro-Putin nor pro-Russian but simply sober realism to understand that US-Russian cooperation is crucial if there is to be an end to a civil war that has killed over 250,000 and has, according to UN estimates, displaced over 6.5 million people. Yet, as longtime Middle East correspondent Patrick Cockburn points out, it is in the interests of the Syrian government to comply with the agreement because “the US and Russia will be targeting al-Nusra, the Salafi-jihadi movement which is the main fighting arm of the non-Isis rebel movement.” After all, it has been al-Nusra that “has been in the forefront of all successful rebel offensives” thus far. Nevertheless, seeking out a political solution to the crisis and doubling down on diplomacy as Obama, Kerry, Putin, and Lavrov have done represents the best chance of finding a resolution to the horrific crisis, especially in light of the alternatives, prominent among which would be the overthrow of a secular regime by radical Islamic fundamentalists. It is also a reminder that non-diplomatic efforts, be they Russia’s seemingly indiscriminate bombing of rebel-held areas or the bungled and counterproductive CIA and Pentagon “train and equip” programs, have only prolonged the war, deepened the humanitarian crisis, and served as a recruitment tool for radical jihadists. In the end, while both countries continue to have significant areas of disagreement over which they may never come to terms, the cease-fire agreement is but the latest in a series of agreements that have been in the national-security interests of both Russia and the United States. They include: the New START treaty (2010), the “123” civilian nuclear agreement (2011), the deal to dismantle Syria’s chemical weapons stockpiles (2013), and the Iranian nuclear accord (2015). And while the supposed Trump-Putin “bromance” is little more than clickbait for the likes of Vice, Buzzfeed and The Daily Beast, serious observers understand that the United States is better off working with Russia to resolve some of the key crises of our time—including nuclear proliferation, climate change, terrorism, and the continuing refugee crisis in Europe—rather than stubbornly against it.